Yesterday, I was able to celebrate (with loads of others) a huge campaign victory. 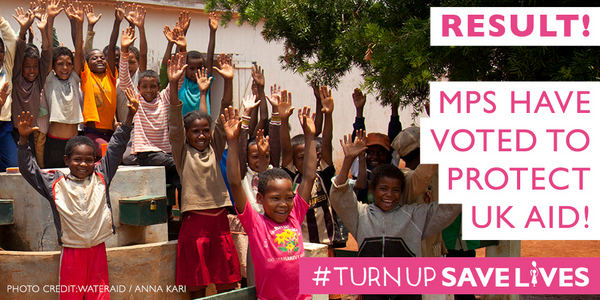 Over the last few months, one of the campaigns that has kept me busy has been #TurnUpSaveLives, a push to enshrine in law our commitment as a country to spend 0.7% of our national income on international development. It’s been hard work (with lots of spreadsheets), but I’ve been fortunate to work alongside a great team of colleagues from 20+ organisations. The bill, which was brought to Parliament by a Private Members Bill from Lib Dem MP Michael Moore, has now passed through the House of Lords and should receive Royal Assent before the election. It’s a big win. 1. A week really is a long time in politics – Days before both the second and third reading, we were still short of the 100 MPs we need to commit to attend, as campaigners it felt like we were running out of time but turns out the MPs are used to making changes to the diaries at the last minute, so a week really is a long time in politics! 2. Movements take time to build – I really enjoyed reading this reflection from Steve Lewis from Results UK, a reminder that the ‘movement’ calling for 0.7% goes back over 30 years, and Steve’s personal memories of a lobby of Parliament in 1984 calling for 0.7%. The votes were the culmination of the campaigning that started over 30 years ago and had grown, often working on other related topics (debt, trade, tax) but coming back when needed to 0.7%. 3. Make sure you know the process – Private Members Bills (PMBs) aren’t like normal bills that are driven by the Government, so understanding the Parliamentary procedure was vital, for example PMBs require you to get at least 100 MPs to attend on a Friday (when most MPs are scheduled to be in their constituencies), have to pass a Money Resolution (where Parliament has to agree to spending money on what’s being proposed), and the outcome of the Second Reading is used to decide the composition of the Bill Committee. It was vital to use supportive MPs to help us understand what to expect to make sure we didn’t miss an opportunity, as well as making use of the helpful Parliament website where you can track the progress of the Bill. 4. Opportunity Cost – For MPs to be in Parliament on a Friday, especially close to the election meant not attending a community event or meeting potential voters. We had to find ways to reduce the opportunity cost for MPs not being in their constituencies, for example we had a Lifesavers gallery where we publicly acknowledged (and thanked via twitter) who was attending, organised a photo moment with a celebrity to help MPs secure local media coverage, and placed a big emphasis on constituents writing or visiting MPs to ask them to attend. 5. 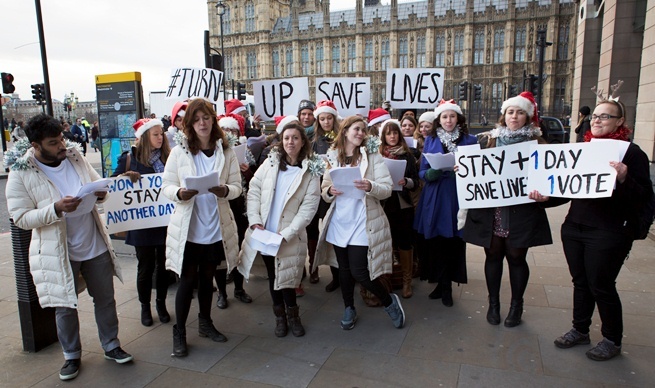 Using Twitter – We got #turnupsavelives trending twice on the day of the Third Reading in December, it was thrilling, but looking through the tweets it proved that twitter can be a bit of an echo chamber, with most coming from those who were involved or supportive of the campaign. However, where we did find twitter useful in the run up to to thank those MPs who had committed to attend or ask those who hadn’t to do so, as well as thanking those that did attend. Encouraging organisations to use their corporate accounts and also those of CEOs or other senior staff worked well, turns out MPs like to be thanked by NGOs. Having access to an in-house designer at Global Poverty Project to quickly turn around images we could share was invaluable. 6. Precedent – Often we’re campaigning were about looking to change somethings, but setting a precedent is one of the most overwhelming reasons not to do something for a politician. We found that early on in the campaign our hope to get parties to whip their MPs into attending was unlikely to happen, Labour doesn’t whip on Private Member’s Bill and didn’t want to set a precedent by doing so for this bill. So finding examples of where a party has done this before is really useful in demonstrating that you’re not asking to set a precedent in supporting your ask. 7 – Don’t forget to say thank you – I remember a MP once complaining to me that after he’d voted for something a campaigning organisation had asked him for the next letter he got was asking for something else. 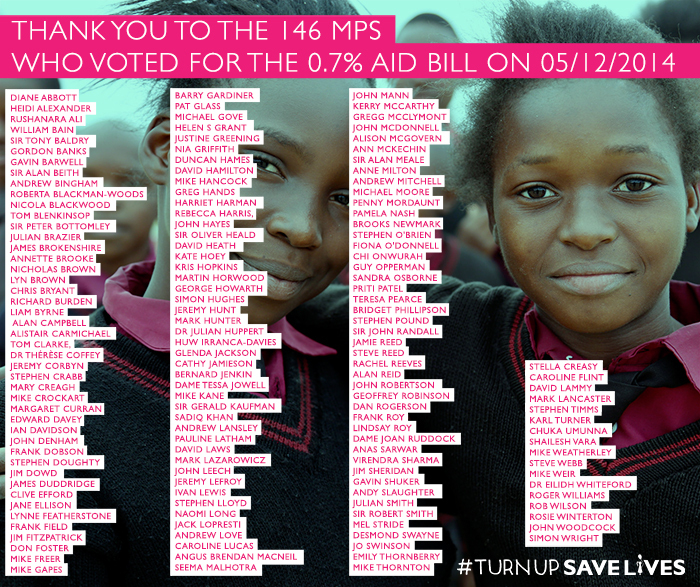 Its easy to forget to say ‘Thank You’ for MPs for voting (and we didn’t do enough after the second reading in September) but come the Third Reading, having a graphic ready to share the names of MPs who’d turned, sending cards from supporters, getting on the phone to key MPs, and writing letters from CEOs ensured we were doing all we could to show our appreciation to MPs who attended the vote. 8. Insider/Outside – The campaign was a great example of how insider and outsider tactics can work together. We needed to be mobilising constituents to email, tweet, call and visit MPs asking them to visit, that helped to create a belief that and a constituency of support, but we also needed to be working the corridors of Westminster, understanding the positions of the different parties, providing the arguments about why we need, getting CEOs to call key MPs to use their influence to make sure we reached enough MPs pledged to attend, etc. 9. Building the right coalition – We didn’t spend lots of agreeing how the coalition was going to work, instead we kept our structures lean and simple forming three groups (one for campaigners, media and public affairs colleagues) with central coordination from Bond. The Turn Up Save Live. We worked to ensure that we tried to get as many organisations involved, including Unions and Faith Leaders. On reflection, we could have done even more to build a unusual coalition in support. 10. Supporters loved it – Lots of organisations reported that the actions they’d invited supporters to take was one of the most popular actions, I think everyone enjoyed the binary nature of the campaign, that your MP was either going to turn up or not, rather than the indirect actions we’re often asking supporters to take appealed to people. 11. Working with Lords is completely different – That’s for another post, but we learnt quickly that the same approach wasn’t going to work. Lords need to be engaged in very different ways. Want to learn more? I’d be delighted to come and speak to your team based on the learning from the campaign. That’s a great post, thanks Tom! People have been campaigning on 0.7% in the UK for over 50 years, I think, the World Council of Churches were calling for it in the 1960s, the UK signed up in 1970, and did it 43 years later. I’ve heard that that mass lobby of Parliament in 1985 was a real gamechanger, WDM organised it and it was the largest lobby of Parliament ever up to that time. It galvanised international development campaigning for the rest of the 80s, which were a discouraging decade on the whole, and beyond. Hi Tom. Agreed – great post and some really useful lessons. On twitter, I share your concern that we are often just talking to each other, which is why I find partnerships with groups like Global Poverty Project really vital. They reach a different, and broader, group and I also agree that they bring different skills, which are invaluable. I take to heart your comment that we need to take the time to say thank you. We don’t do it often enough. I’ve made a note to be sure to do this post September, when all those world leaders who have supported our calls for ambitious SDGs will be facing the even harder task of delivering on them. Great blog Tom. Thanks for the Shout-out to my blog last December. Good to hear Ben Niblett reinforce my hazy memory of the 1985 WDM Lobby of Parliament – I also remember it as being a major event at a time when international development was under the cosh. Lastly thanks to you and the team at BOND and others who worked on this very effectively. I wonder why we collectively, the NGOs, on this occasion were able to work together quickly and effectively without too many problems of ‘branding’ and ownership etc.